Via Jeffrey Morgenthaler, the Kingston Club is one of the best drinks I have tried in a long time. Seattle finally decided to get warm, so I’ve been drinking lots of highballs in an attempt to beat the heat. I’ve also been ordering highballs around the city, and I’m disappointed to tell you that even many craft bars will manage to screw up this format. The most common mistake I see is the failure to use enough ice. 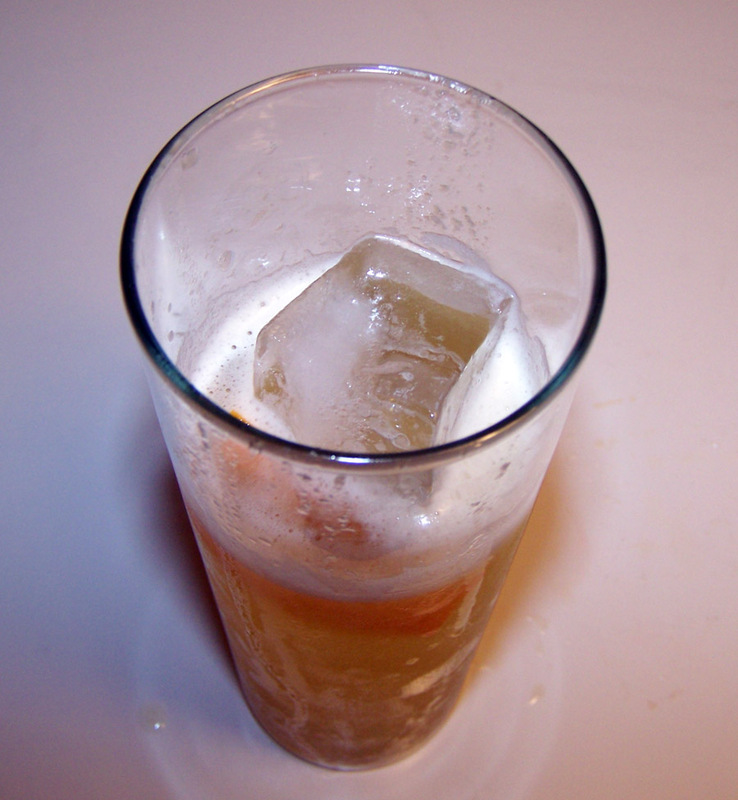 When you make a rocks drink, it is essential that you fill the glass completely with ice. If you don’t, it will melt too quickly, and you will be left with a watery highball, its flavor a mere specter of your intention. For this reason, I don’t recommend ordering a highball when you are eating at a restaurant; even if the bartender was diligent, it may take your server a while to bring you the drink, and the ice will melt. I can’t remember where I heard this line, but I like to tell my guests to “drink it before the ice gets scared”. I’d never owned a bottle of Drambuie before last week, and this was the drink that convinced me to make the purchase. I love its peppery, scotchy flavor, and I was intrigued by Morgenthaler’s use of this spirit as the base of a Tiki drink. Fill a Collins glass with ice and one ounce of soda water. Shake over ice and strain. Garnish with an orange peel. If you followed the link above, you saw that his was a lot prettier than mine, but that’s OK, because mine was just as delicious. You would think that equal parts of liqueur and fresh pineapple juice would be too sweet, but the level of citrus in this drink was perfect, making it much dryer than I had anticipated. When I was planning to make this drink, I remembered it as having rather more Fernet than it actually does, but when I went to make it, I discovered it had only a teaspoon, which is exactly equivalent to 1/8 of one ounce. Those who have been reading for a while will recall my love of Fernet and Pineapple, which was one of the main reasons I wanted to make this. As such, I apologize for the low amount of Fernet in this drink, and I will try to find one for you that has substantially more in the near future. Categories: modern drinks, tiki | Tags: angostura, bitters, booze, cocktail, cocktails, collins, Drambuie, drinking, drinks, fernet, fernet branca, highball, mixed drinks, mixology, pineapple, pineapple juice, tiki | Permalink.